A dynamic success system for young and old alike — proven to bring you greater wealth, direction, self-confidence and fulfillment! Discover the Success Secrets that Transformed a Failing Young Salesperson into an Industry Superstar and Made Him a Millionaire by Age 27! Success. It’s something we all wish for. But for many, success eludes them. For others, it seems to fall into their laps. Are some people just luckier than others? No. Success is by design. And probably the best person you could learn the secrets to success from is a salesperson who once struggled, but figured out the answers for himself. A salesperson’s income, be it big or small, is based on his or her mindset. Daily, the salesperson must enter the lion’s den of business to convince total strangers to part with their money. And daily, the salesperson must overcome his or her fears, and the punishing sting of rejection. Winners, take all in this field. The most accomplished earn staggering incomes, develop rewarding networks of friends and live the American dream. But this message isn’t about learning how to sell. No it’s about discovering Tom Hopkins’ decades worth of hard-won success secrets … to master-charge your life, and create unlimited opportunities for more fun and advancement! Helpful for all ages, this series is highly recommended for young adults. At the age of 19, Tom Hopkins dropped out of college. This terribly upset his dad who told him, “Son, your mother and I will always love you—even though you’ll never amount to anything.” Wanting to prove his dad wrong and achieve great success not only in business but in life, Tom began a course of self-education. By the time Tom Hopkins turned 27, he was a millionaire salesperson in real estate. He set incredible records that remained unbroken until this century. His last year as a real estate agent, he sold an unbelievable 365 homes—the equivalent of one each day! Grand total, he closed 1,553 real estate transactions in a period of six years. He’s a recognized sales trainer having trained personnel in The US Army, Best Buy and AFLAC and State Farm and 200+ other companies. 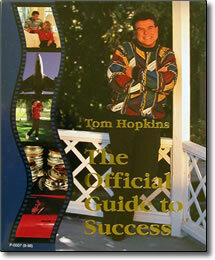 Now – you can discover all of Tom’s unstoppable success secrets from in his 4CD home-study course titled The Official Guide to Success. Put this exciting CD program in your hands and you get 12 sessions on different topics packed with dynamite success secrets! Once you start listening, I think you’ll agree these aren’t your ordinary “success secrets.” That’s because Tom’s revolutionary success system was perfected and fine-tuned during 19 years in the trenches of the toughest, profession on Earth – sales! And yet … Tom Hopkins and his students are some of the happiest people you’ll ever meet. As you’ll soon see, these secrets go deep into step-by-step detail about what to do daily, even every hour to blueprint and manifest your desires! Amazing Things Happen When You Use Tom’s Explosive Success Secrets! Imagine blasting through roadblocks, re-wiring bad habits and unleashing your inner genius. Tom shows you how! After you listen to this special program you will be a different person than you were before you went into it. You’ll think differently and because of having better, stronger thought processes you’ll act differently.